Our regular users may already be familiar with our Essex Ancestors service, which allows subscribers to view digital images of Essex parish registers and wills. These are two of the most important and useful resources for family historians. Parish registers contain baptisms, marriages and burials for each parish in Essex, while wills can give you fascinating information about your ancestor’s lives. 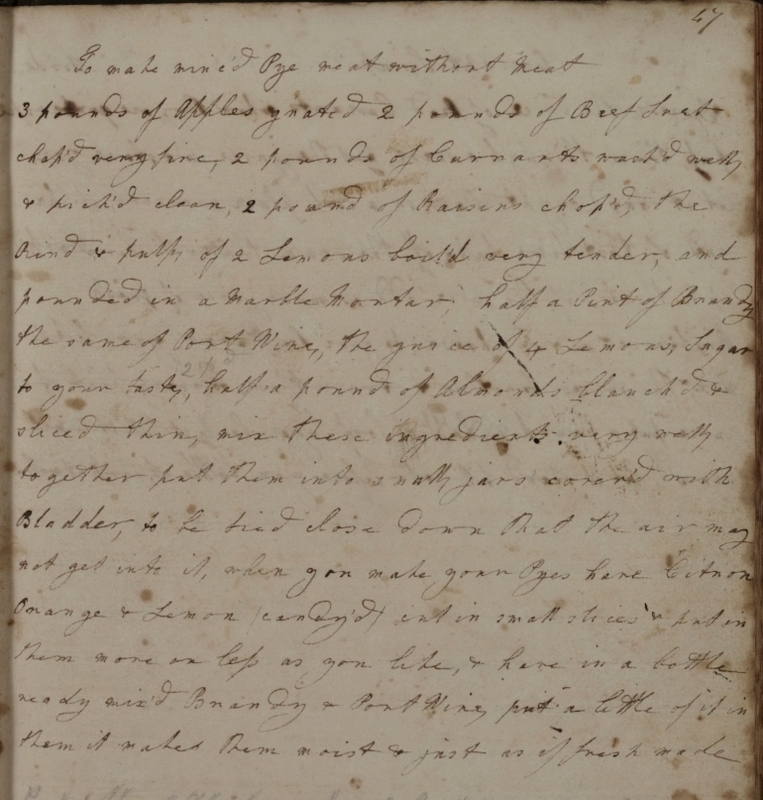 Launched in November 2011, the service initially included all of our pre-1837 registers, and post-1837 registers for parishes beginning with letters A-F, along with about 20,000 of our 70,000 wills. After much hard work from our digitisers, archivists and software developers, we have now completed the process of uploading the post-1837 registers for parishes from G-W. This amounts to 228,786 images! You can use the Essex Ancestors service free in the ERO Searchroom, or from home as a subscriber. Find out how to subscribe on the Essex Ancestors home page, where you can also access the user guide and FAQs. Parish registers are some of the most useful resources for family historians, and can date back to 1538. – To be certain whether images have been published for a particular register, view its catalogue description. If there is not an image available, you will simply see a description of the document. If there is an image available, there will be a box on the right hand side with an Essex Ancestors logo. The current update will mean that Essex Ancestors covers almost the complete historic county of Essex. Just one small area will be completely missing: registers for the London Borough of Waltham Forest, covering the parishes of Chingford, Leyton (including Leytonstone) and Walthamstow, are held by Waltham Forest Archives. 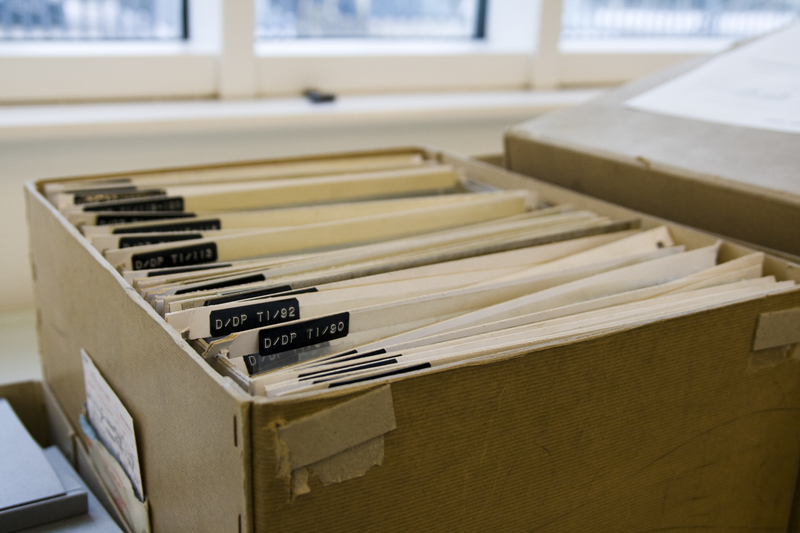 A project to copy these Waltham Forest registers is due to be completed in 2013. 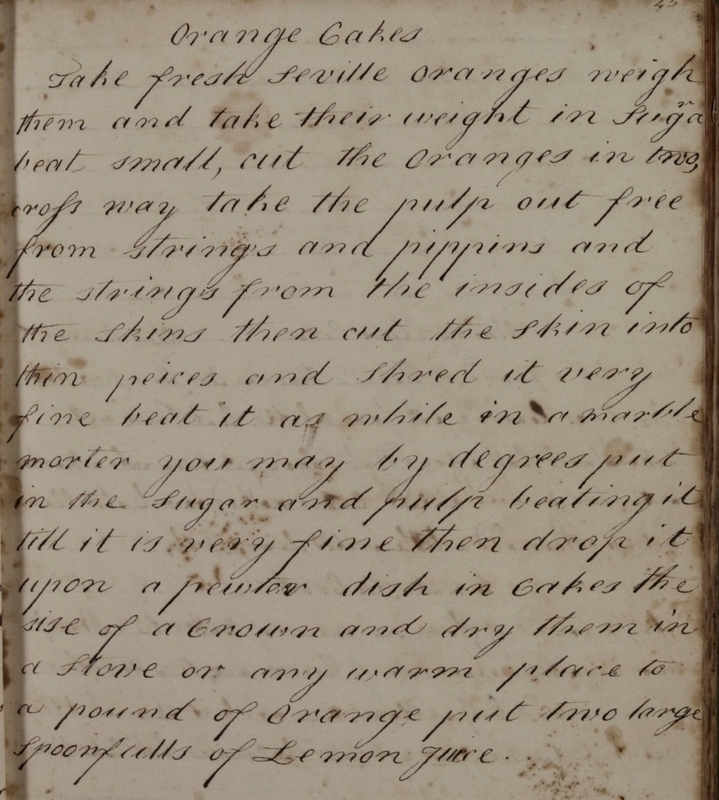 We have also started work on digitising our remaining wills, this is a big job involving our Conservation Studio as well as digitisation, so look out for more updates in the future. In the meantime – happy searching! We recently unearthed this film made by Essex County Council in 1981 to promote the largescale new development of South Woodham Ferrers. The five minute film is a shortened version of the full 23 minute promotional film released to attract families to the then newly developed town.The short film positioned South Woodham Ferrers as the ideal country town, providing a rural lifestyle yet with all the amenities and transport links sought after by the industrious family in the booming early 1980s. The film also includes a song written especially to promote the town, including the lyrics, ‘South Woodham Ferrers, it’s a whole new place to be … now’s the time to be here, there’s all you’ll ever need’. Anyone interested in viewing the full version order it in our Searchroom (reference VA 3/8/9/1). Also available are the original pamphlets promoting the town, which are advertised at the end of the film. The brochures promote the town’s ‘Very attractive buildings to delight the eye and rest the mind’, and asks ‘Where are the shops?… the housewife’s inevitable and very important question.’ (Have a look in pamphlet box W9 in the ERO library). We have just re-opened after our two week annual stocktaking closure where we take the opportunity to do all the jobs which we cannot do while we are open to the public. 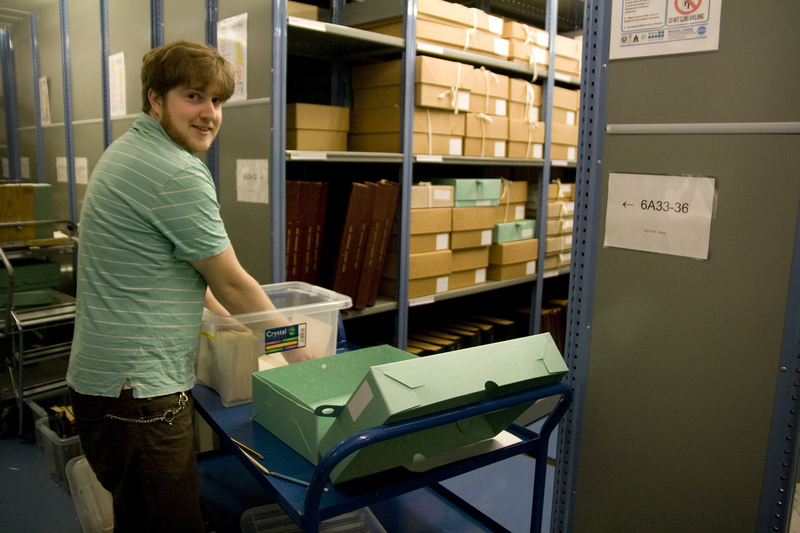 Stocktaking gives us an opportunity to sort out large accessions, carry out large re-boxing projects, and reorganise shelving to make the most of our storage space. 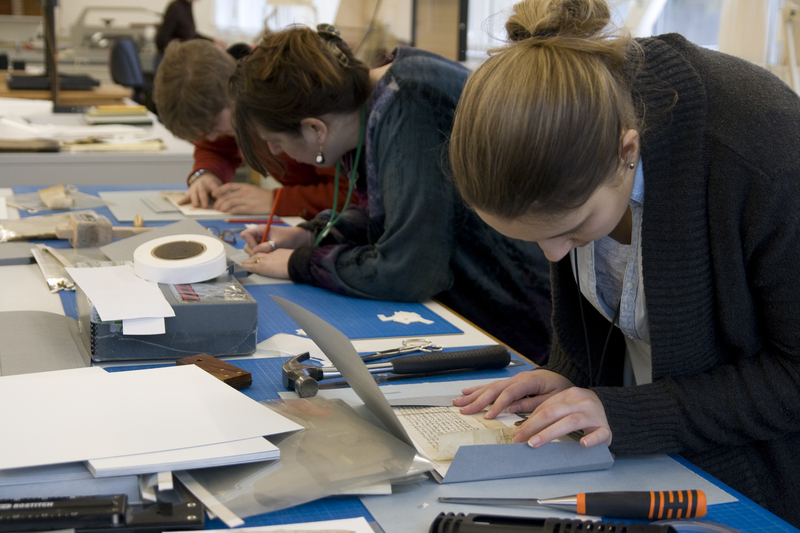 One of the big projects undertaken during stocktaking was begining the re-storing of hundreds of medieval deeds. 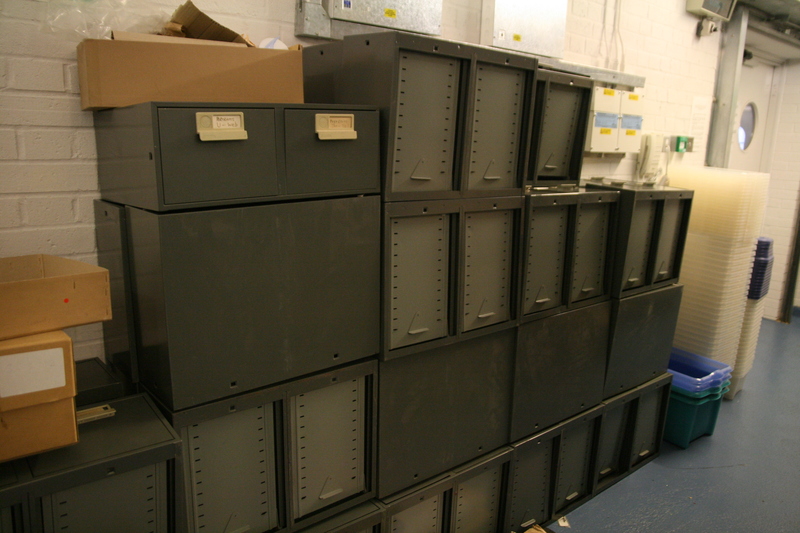 The deeds were stored in boxes arranged a bit like filing cabinets, hanging in plastic folders. A huge amount of effort must have been put into storing them like this a few decades ago, but the boxes had deteriorated and the ‘filing cabinet’ system had collapsed in most of the boxes. Medieval deeds stored in a ‘filing cabinet’ box. The plastic folders collapse, and damage the deeds inside. The deeds have now been stored in custom designed ‘Harris folders’ (named after one of our archive assistants!) which are wedge shaped to allow space for the seals at the bottom of the documents. 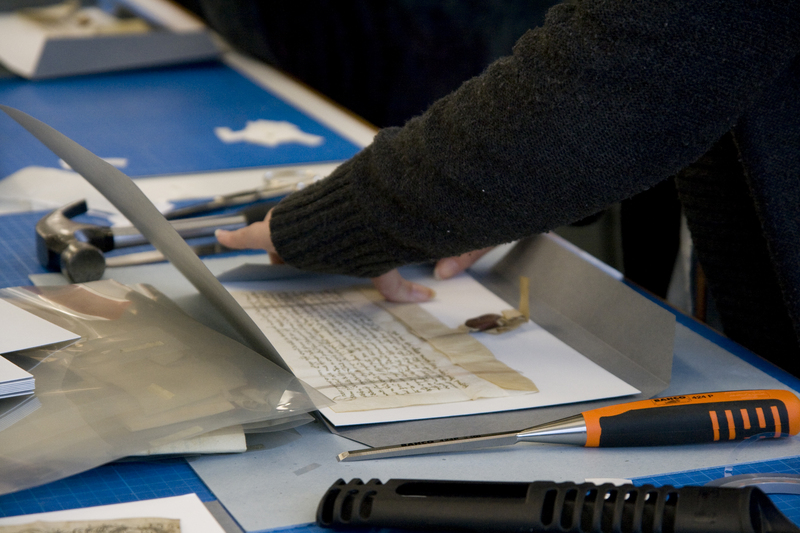 The deeds are held in place on a board using thin strips of melinex (a special acid-free plastic), and then placed in the wedge folders, before being placed in acid free archival boxes. This means that the documents are going to be much happier in their new storage, and they are easier for the staff to find and produce. Storing deeds in ‘Harris’ folders. These are wedge shaped to protect the seals attached to the documents. Much of the work that we do during stocktaking involves re-boxing documents. This means removing documents from old cardboard boxes, which over time become acidic and eat away at the documents inside, and placing them in new, acid-free cardboard boxes made especially for archives. These boxes are also designed to fit perfectly on our shelves, making the best use of the available space. The boxes arrive flat packed, and we have made up around 500 of them! 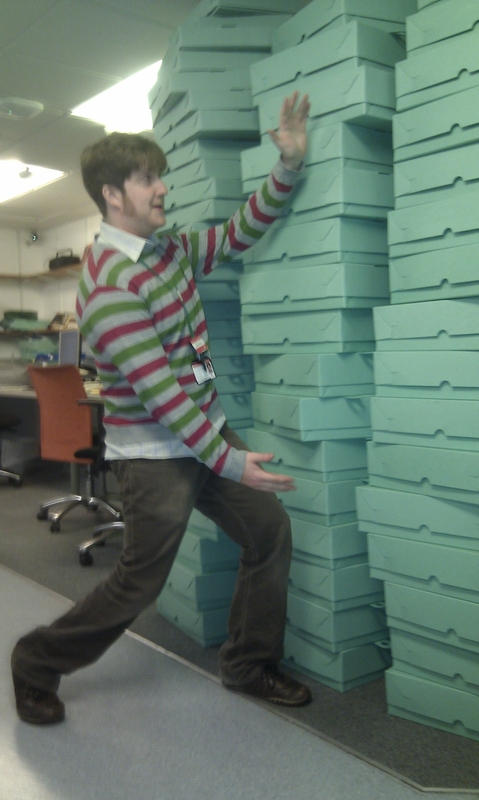 Look how many boxes we made! This year’s stocktaking also saw the exciting replacement of one of our Searchroom windows. 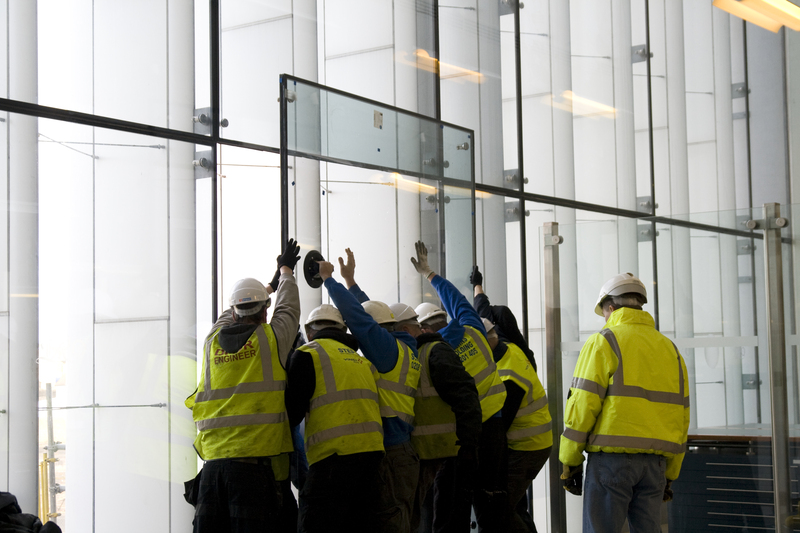 Regular users have probably noticed that a crack in one of the large glass panels had grown much more serious recently, and before it became a hazard the window has been replaced. Installing the new window was quite a feat to watch! We have also made some minor alterations to the Searchroom, and given everything a good clean and tidy up. Thankyou all for bearing with us while we get these important jobs done. Are you looking for a Christmas gift with a difference? 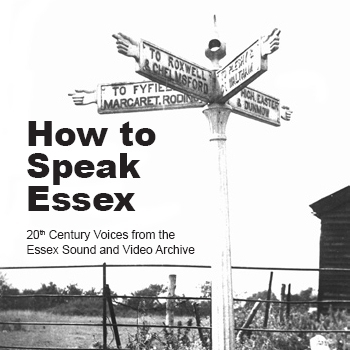 Our CD called How to Speak Essex: 20th Century Voices from the Essex Sound and Video Archive may be just the thing for that awkward relative or friend who seemingly has everything. The CD includes examples of Essex accents and dialect recorded in the twentieth century. The earliest example dates from 1906, while the majority are recordings of people born between 1900 and 1940. The CD includes both speech and song, with examples from across the county. I wanted to produce the CD both as a way of promoting the Essex Sound and Video Archive – not everybody is aware that the Essex Record Office collects and preserves sound recordings and videos – and in order to present genuine examples of the way ordinary people in Essex spoke in the twentieth century. The decline of the Essex dialect and accent, and the seemingly unstoppable spread of theLondonaccent, has been discussed and mourned a great deal in recent times. When people think of the language of Essex they are most likely these days to think of ‘Estuary English’ rather than a soft and lyrical rural accent akin to that heard still in other parts of East Anglia. On the other hand, someEssexresidents can, perhaps, have a nostalgic or exaggerated view of the accents used by former generations. Our CD should provide enough genuine examples to enable a realistic understanding of the language of Essex people born prior to the Second World War. The recordings should also demonstrate the diversity of accents in Essex. I have split the county into ten geographical areas so that the listener can compare, for instance, the accents of villages in the north of the county borderingSuffolkwith areas of historic Essex now deemed to be part of Greater London. However, even within these relatively small areas a good deal of variety can be heard. The extracts cover a range of topics and will hopefully provide some insight into life inEssexduring the twentieth century. I have tried to group them in ways which provide a degree of narrative, thus helping to make the CD enjoyable as well as instructive. However, the main effect should be to bring alive the speakers and their use of language. The CD is available direct from the Essex Record Office priced at £10.20, including postage and packing. You can order your copy by telephoning 01245 244644, or writing to: Essex Record Office, Wharf Road, Chelmsford, CM2 6YT, enclosing a cheque made payable to Essex County Council.